December data from Spinter Tyrimai over potential candidates to the post of president presented a surprise – economist Gitanas Nausėda stepped over the other two favourites. Based on a survey commissioned by the Delfi news portal from the public opinion and market research company Spinter Tyrimai on December 11-19, if the presidential elections were to be held this coming Sunday, economist G. Nausėda would receive 15.6% of the vote. 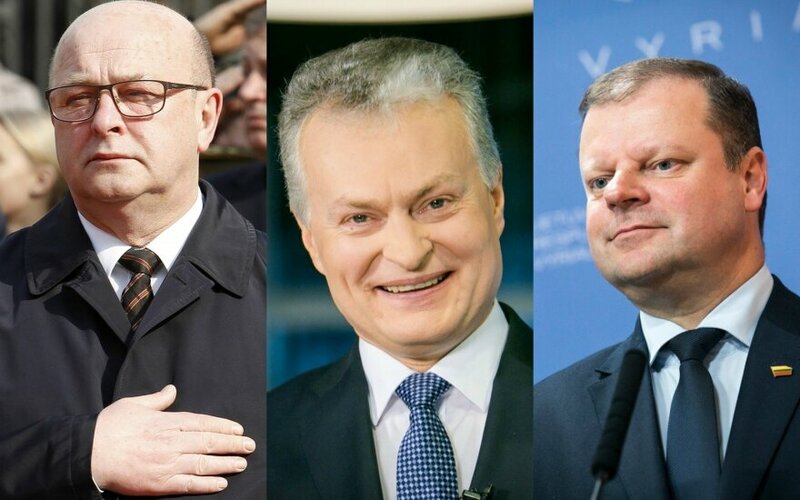 In second and third we find Prime Minister Saulius Skvernelis with 11.3% of the vote and Kaunas Mayor Visvaldas Matijošaitis with 10.9% support. Which presidential candidate would “protest Lithuania” choose? Next line up social democrat MEP VIlija Blinkevičiūtė, who retains popularity with 7.7% of respondents' support and MP Naglis Puteikis, with 5.5% support. Even further down the list are three personalities who are often discussed as potential conservative candidates in the upcoming presidential elections. Former Finance Minister, MP Ingrida Šimonytė would receive support from 5.3% of voters, while EU ambassador to Russia turned academic Vygaudas Ušackas and MP Žygimantas Pavilionis – 4% each. Former PM, Social Labour member Algirdas Butkevičius would receive 3.5% of the vote and "Farmer" leader Ramūnas Karbauskis – 3.4%. 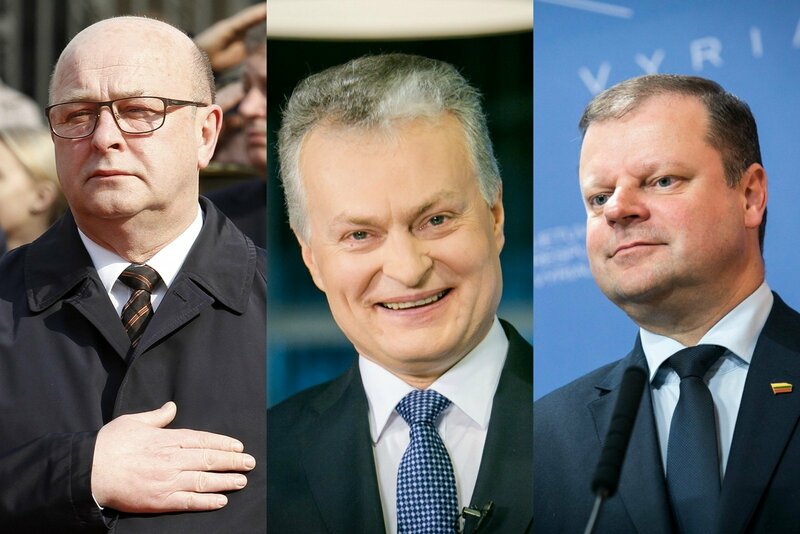 MEP Antanas Guoga received support from 2.9% of survey respondents, Lithuanian Industrialists Confederation president Robertas Dargis – 2%, Vilnius mayor, liberal Remigijus Šimašius – 1.1% and former Labour Party chairman, MEP Valentinas Mazuronis together with MEP, liberal Petras Auštrevičius – 1% each. General Jonas Žemaitis Lithuanian War Academy director for science and studies, Professor Jūratė Novagrockienė highlighted that other data in the survey linked to S. Skvernelis bodes poorly for him. The December data from Spinter Tyrimai shows that there was a 2.7% (error margin of 3.1%) decrease in those thinking that S. Skvernelis is most suited for the post of prime minister. In November 19.2% of respondents thought so, in December – 16.5% of respondents. The ratings of the Lithuanian Farmer and Greens Union, which delegated the prime minister dropped by 4.5%. In November, the party had the support of 19.4% respondents, while in December – 14.9%. "These are greatly linked matters because G. Nausėda is independent while S. Skvernelis, be it as it may, will be linked with both the cabinet and the "Farmer" majority in parliament. With their metrics declining, so will S. Skvernelis'," J. Novagrockienė said. According to the political scientist, this is also added to by the recent public discussions on businesses linked to "Farmer" leader R. Karbauskis, their lands and affairs related to fertiliser. "Like it or not it makes people think that something is off with those working there," J. Novagrockienė said. According to the political scientist, G. Nausėda is akin to current President Dalia Grybauskaitė, who is respected by the public. "The president finds a balance when there is a lack of common sense in parliamentary or ministerial decision making. She neatly comments on many matters, thus it is natural that her ratings will remain. Especially when D. Grybauskaitė's tone was much stricter, it has calmed down, but is very matter of fact," J. Novagrockienė said. According to the political scientist, this is where the head of state and G. Nausėda are very similar – they speak very matter of fact way, professionally, with no radical stances. "I believe that this is an attracting point because the more fiercely political parties and their leaders discuss, the less the public likes them," J. Novagrockienė said. The political scientist also pointed out that in terms of the December party ratings, the number of respondents who are undecided or would not vote has risen. In November, there were 25.8% of such respondents, in December – 29.3%. "This metric is fairly significant because if the number of non-voters rises, this shows they have no-one to vote for. We cannot make a comparison in terms of the presidential elections, but in terms of the parties, we can say there is a trend of disappointment with parties. It was always notable in Lithuania and has lately become even more prominent," J. Novagrockienė said. According to the political scientist, G. Nausėda is also appealing as a potential candidate because he is neutral, something that both political parties and the public want. "G. Nausėda matches this public desire the best because the public dislikes the clashes between political parties or within them from previous times," J. Novagrockienė said. The political scientist dispelled the myth that G. Nausėda appeals to only more educated residents of major cities. "I believe that with his moderate, calm talk, knowledge of issues, he can be appealing to everyone. There are intellectuals who talk in very difficult language, for example, I believe that Vytautas Landsbergis suffered from not everyone understanding when he spoke. Meanwhile G. Nausėda, I believe talks sufficiently understandably and he can also draw people from the province," J. Novagrockienė said. The political scientist does not believe that G. Nausėda may be hindered by him being the representative of a major business, working as advisor to the SEB bank. "Of course he is an analyst for a bank, but he is primarily linked not with the business, but having knowledge, professionalism and expertise. V. Matijošaitis would rather be linked with business and then he's fairly high up because he accrued his ratings because he is faring quite well with Kaunas," J. Novagrockienė said. According to the political scientist, when people decide whom to vote for in the presidential elections, they usually think about social issues. "They do not raise global, security or state questions; they are more concerned with dignity, social status and social security. A president should talk about foreign policy, but if we look at the less educated individuals, they care little for foreign policy, they are more interested in what will happen to their local environment, security, social and economic status," J. Novagrockienė said. Public relations specialist, public relations agency Fabula Hill + Knowlton Strategies board chairperson Mykolas Katkus reminded that G. Nausėda is no new participant for potential political processes. "We can recall how in 2004 he was the chief advisor to Valdas Adamkus' headquarters. He has even participated in debates as V. Adamkus' team chairperson. V. Adamkus said that he would support G. Nausėda in his second term," M. Katkus said. G. Nausėda has no longer been an economist ever since then, the public relations specialist believes. "In the Baltijos Tyrimai [Baltic Investigations] which were held then, where people had to specify the individual they view positively, G. Nausėda would appear frequently. For the few last years it was rarely that in such research he would not have more than a 50% approval rate," M. Katkus said. The public relations expert concluded that G. Nausėda was visible and remembered by people all the time. "I would also like to remind how in 2008, prior to the 2009 elections, there also was some clamour surrounding G. Nausėda. But at the time D. Grybauskaitė's ratings were such that it was not a suitable moment for Mr. Nausėda," M. Katkus said. According to the public relations specialist, now people select their president somewhat differently than the politicians they support. "A specific set of qualities that people want is attributed to the president. According to people, the president must know foreign languages, must be strong and strong willed, but at the same time – human," M. Katkus said. According to the public relations specialist, people see G. Nausėda as a potential candidate despite him not having declared his intent to participate in the elections. "While the 15.6% rating may not be large, but keeping in mind that this person has not declared his intent to run for the office in any way, it is clear that it is a major vote of confidence. And it is clear that both competitors, as he himself should take his chances much more seriously after this survey," M. Katkus said. In respect to the Spinter Tyrimai data for December, the public relations specialist summarised that the "Farmer" and affiliated politicians' honeymoon is gradually ending. "It can be seen from the "Farmers'" ratings. These are no longer the 29% ratings of right after the elections where it looked like Lithuania is turning to the Polish model. These are fairly normal ratings of a Seimas majority which is facing difficulties. The Social Democrats maintained much higher ratings during their rule, up to the very end, just received somewhat less in the elections," M. Katkus said. According to the public relations specialist, this shows that with a new election cycle nearing, typically with a year left to the elections, people begin seeking new candidates, new figures. "N. Puteikis' appearance among leaders appears to be drawing a part of the voters. It is clear that the eyes of the protest electorate, which "protests" for about a year when its favoured government is elected and later turns to searching for someone new, have now begun turning to N. Puteikis," M. Katkus said. The public relations specialist observed that the centre of the political spectrum currently lacks a charismatic personality and strong leader. "Neither Mr. Gentvilas, nor Mr. Guoga, nor Mr. Šimašius are the leaders anymore who urban and young citizens look up to. The Conservatives also are unable to draw those people and here we likely have an effort to seek a different option, who could be the person who could present their opinions," M. Katkus said. The expert highlighted that the liberal electorate is experiencing difficult times because in essence it has no charismatic politicians who represent its interests. "As for the political party that did, let us remember was very popular in its time, but is no longer representing them. Perhaps a part of those voters chose the Conservatives, but once again, it is a "marriage" out of calculation. But here you go – Mr. Nausėda: young, handsome, intelligent and famous, reliable in a sense," M. Katkus said. However, the public relations specialist suggested to not hurry with generalisations because it cannot be dismissed that G. Nausėda will not run for president. He has so far not expressed a clear desire to definitely do so. "Candidacy is a truly disgusting process, during which all real or made up sins are dragged up. The person may say something out of line and it sticks. Questions of conflicts of interest arise," M. Katkus said. According to the public relations specialist, public capital does not always translate smoothly into political capital. "If people view you as a nice person, a good expert, interesting politician and citizen, it nevertheless does not mean that the same ratings and popularity will be there when talking of other matters," M. Katkus said. The expert was struck by G. Nausėda's time with V. Adamkus. He muses that the economist is seen as "a representative of that tradition", a person who is not antagonising, pleasant, warm and appears good. The public relations expert said that it is currently too early to predict what topic will dominate the coming presidential elections; however, he would guess that these elections would be for European normality. "We are becoming a somewhat extreme state in many regards recently; we are becoming first here in one place, here in another. When everything proceeds calmly, people usually seek something stricter, more acute. When everything is fluctuating, struggles happen, then it is natural that those things become exhausting and then one wants something calm, someone who does not participate in those things," M. Katkus said. However the public relations expert observes that another direction exists where N. Puteikis has his chances, reflected in the call of "let's do something because things will soon go bad for Lithuania." People are worried about the topics of emigration, income inequality and want to "do something." "The main topic becomes clear only in the second round of presidential elections. Usually every candidate tries to seek the topic they need. The topic of President D. Grybauskaitė was as follows: "I will oversee that they don't steal too much." We will see what the topic is in this election, it usually crystallises in a certain opinion field," M. Katkus said. Public opinion and market research company Spinter Tyrimai performed a public opinion survey on December 11-19, 2017 on commission from the news portal Delfi. Citizens aged 18 to 75 participated. The survey was held in the form of a standardised interview. The survey was performed across Lithuania in a total of 65 points, distributed to represent the country's entire territory. During the research, 1006 respondents were interviewed. The distribution of research participants is proportionate to the number of residents in the country's regions. Indrė Makaraitytė. Who will ride the Vytis to the presidential elections? Intriguing meeting between Karbauskis and Matijošaitis in Kaunas – presidential negotiations begin?